When it comes to drywall installation services, many homeowners stress about finding the perfect drywall company. It is true that choosing the wrong group can end up costing you plenty of time and money. Finding the best drywall contractors in Chicago can be a challenge, but we are here to help! AZ Drywall Finishing has been providing top-notch results to our growing client base since 1999. By delivering the best possible products with respect and integrity, we are confident in our ability to exceed each customer’s high expectations. While our drywall finishers are obsessed with quality, we know that not all drywall contractors are the same. 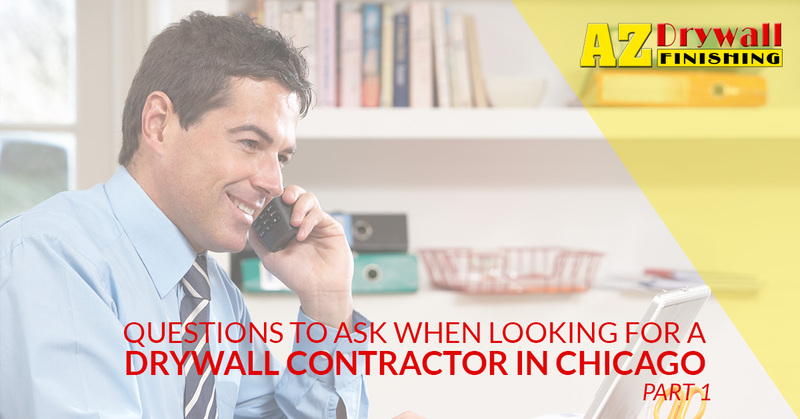 Today, we’ll look at a few key questions that you can ask potential drywall contractors in the Chicago area. This way, you’ll be able to make a better decision on who to utilize for your commercial or industrial project. How Experienced are You in the Drywall Industry? Many drywall projects come with their own unique needs and challenges, creating an environment where having plentiful experience can come in handy. When the unexpected arises, inexperienced drywall companies may try to cut corners or work quickly to cover up the issue. This can lead to long-term headaches for you and your structure. Hiring veteran drywall installers may help in avoiding costly surprises and complex issues. Be sure to ask for a list of projects that your potential contractor has worked on, as well as the number of years they have been in the industry. Are You Covered with Insurance and Workman’s Compensation? With the high number of renegade drywall contractors travelling through the country, it’s important to inquire about insurance coverages before letting any company work on your project. Liability insurance is vital for protecting your job site from any damages incurred by the drywall company. When a group causes damage without insurance, you as the property owner or contractor may be responsible for the cost of repairs. The same concept applies with worker’s compensation, where technicians who suffer an injury on your property are insured for coverages. Otherwise, you as the property owner may be on the hook for paying all of the medical fees! In the end, none of these risks are worth it, so AZ Drywall Finishing recommends making this a mandatory part of your interviewing process. Can You Supply Numerous References? Word of mouth is an effective way for drywall contractors to gain traction as a reputable source for construction services. As such, it should be no issue for your potential drywall company to release several references that you can call and ask for an outside opinion. If they are unable to furnish a list of quality names and numbers, we’d recommend continuing your search. Finding the perfect drywall contractors for your Chicago project can be a very involved process. Asking pertinent questions can help you to determine whether or not a company is right for you. Next time, we’ll cover a few more questions that can be useful picking the best option possible. Anyone seeking a commercial drywall company will be impressed when they work with AZ Drywall Finishing. From start to finish, our quality employees are here to exceed your high expectations. Feel free to contact us today with questions or to receive your free quote!